Jane Appenbrink likes to be “on the cutting edge” of new things. A resident of McCauley House, an archdiocesan residence in South Philadelphia that provides transitional housing for medically fragile homeless women, Appelbrink got a chance to do just that on Dec. 13. She and approximately 100 fellow clients of archdiocesan Catholic Social Services’ housing and lunch programs kicked off “Sharing Hope, Filling Hearts,” a new initiative launched this year by Catholic Social Services (CSS). As part of the outreach, the CSS clients prepared 550 Christmas stockings for children and at-risk youth attending the 63rd annual Archbishop’s Benefit for Children. Each stocking included stuffed animals, snacks, crayons and coloring books, all donated by various archdiocesan agencies and area businesses. That’s exactly what the project was designed to accomplish, said Amy Stoner, director of CSS’s community based services division. Stoner noted that the initiative affirms the dignity of CSS’s homeless and lunch clients. “It’s very important to give everybody an opportunity to be of service,” she said. In recent years, many charities have invited their clients to participate with projects and activities. Such participation enhances client experiences while offsetting what is sometimes called “toxic” or “one-way” charity, which overlooks the talents and capabilities of those who are served by a given outreach. 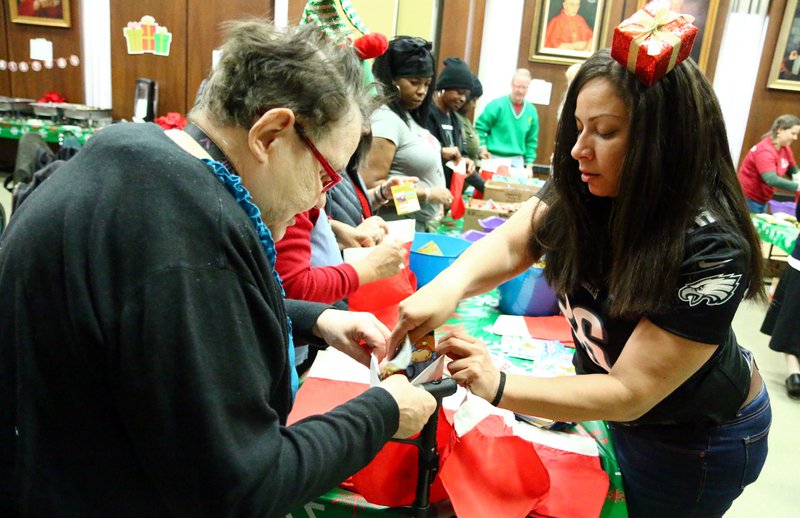 In addition to helping CSS’s adult clients, the stocking stuffer event “tied into the mission of the Archbishop’s Benefit for Children,” said Rosemary Chetalo, program director at Women of Hope, an archdiocesan residence in Center City for homeless young adult women. Originally a one-day event, the celebration has evolved into a year-round fundraising campaign. The benefit, which was held at the Philadelphia 201 Hotel on Dec. 18, supports a number of CSS projects that collectively assist more than 16,000 at-risk children and youth. The outreaches include prenatal and new mother programs, after school care and homeless shelters, among others. Nearly 500 children from more than a dozen CSS programs attended this year’s benefit.